BACKGROUND AND PURPOSE: Traumatic axonal injury is a primary brain abnormality in head trauma and is characterized by reduction of fractional anisotropy (FA) on diffusion tensor imaging (DTI). Our hypothesis was that patients with mild traumatic brain injury (TBI) have widespread brain white matter regions of reduced FA involving a variety of fiber bundles and show fiber disruption on fiber tracking in a minority of these regions. MATERIALS AND METHODS: Ethics committee approval and informed consent were obtained. Twenty-one patients with mild TBI were investigated (men:women, 12:9; mean age ± SD, 32 ± 9 years). In a voxel-based comparison with 11 control subjects (men:women, 8:3; mean age, 37 ± 9 years) using z score analysis, patient regions with abnormally reduced FA were defined in brain white matter. MR imaging, DTI, and fiber tracking characteristics of these regions were described and analyzed using Pearson correlation, linear regression analysis, or the χ2 test when appropriate. RESULTS: Patients had on average 9.1 regions with reduced FA, with a mean region volume of 525 mm3, predominantly found in cerebral lobar white matter, cingulum, and corpus callosum. These regions mainly involved supratentorial projection fiber bundles, callosal fibers, and fronto-temporo-occipital association fiber bundles. Internal capsules and infratentorial white matter were relatively infrequently affected. Of all of the involved fiber bundles, 19.3% showed discontinuity on fiber tracking. CONCLUSION: Patients with mild TBI have multiple regions with reduced FA in various white matter locations and involving various fiber bundles. A minority of these fiber bundles show discontinuity on fiber tracking. In mild TBI, FA reduction has been demonstrated in the corpus callosum, internal and external capsules, and the centrum semiovale, both in an acute and chronic stage.15,19 Axonal injury is probably more widespread in mild TBI, as indicated by global decrease of white matter FA.22 However, it is unclear which white matter fibers may be affected. It may be suggested that similar predilection sites of traumatic axonal injury are involved in mild TBI, as are known from patients with more severe TBI.9–12 In addition, it is unclear whether areas of decreased FA in mild TBI correspond with fiber disruption. Our hypothesis in the present study was that patients with mild TBI have widespread brain white matter regions of reduced FA, involving a variety of fiber bundles and show fiber disruption on fiber tracking in a minority of these regions. The study was approved by our local ethical committee, and subjects' informed consent was obtained. We investigated 21 patients with mild TBI (12 men and 9 women; mean age ± SD, 32 ± 9 years), which was defined as traumatic head injury with an initial Glasgow Coma Scale (GCS) score at or more than 13. Head injury was caused by a traffic crash in 14 patients, by aggression-related blows to the head in 4 patients, and by a fall in 3 patients. The median time interval between injury and MR investigation was 5.5 months (minimum, 0.1 months; maximum, 109.3 months; first quartile, 0.5 months; third quartile, 31.5 months). In this time interval, patients had no repeated episodes of TBI. Our patient group was selected from 43 consecutive patients who were referred to our neuroradiology department for DTI evaluation of TBI between June 2006 and May 2007 and who had no known history or MR imaging evidence of additional central nervous system disease. From these 43 patients, we excluded those with movement artifacts on the MR image (n = 7) and those with moderate or severe TBI (GCS, <13; n = 15). We investigated 11 control subjects (8 men and 3 women; mean age ± SD, 37 ± 9 years) for reference values. They were volunteers from our department and had no known history or MR imaging evidence of central nervous system disease. Investigations were performed on a 1.5T system (Sonata; Siemens, Erlangen, Germany). Straight head positioning without tilt was aimed for in each patient and control subject. The MR protocol consisted of an axial 3D T1-weighted scan (TR/TE, 11/4 ms), an axial fluid-attenuated inversion recovery (FLAIR) scan (TR/TE/inversion time, 9480/112/2390 ms), an axial T2*-weighted gradient-echo (GE) scan (TR/TE, 1330/33 ms), and an axial echo-planar imaging DTI scan (TR/TE, 5700/110 ms; FOV, 24 × 24 cm; image matrix, 128 × 128; 30 sections with 4-mm thickness; nominal voxel size, 1.875 × 1.875 × 4 mm; number of signal intensity averages, 3) with diffusion gradients set in 25 noncollinear directions using 2 b-values (b = 0 and 1000 s/mm2). The DTI scan took 7 minutes and 30 seconds. DTI data were processed on a voxel-by-voxel basis with dedicated software (DPTools, http://www.fmritools.org). A correction algorithm was applied to the DTI dataset to account for distortions that were related to eddy currents induced by the large diffusion-sensitizing gradients. It relied on a 3-parameter distortion model including scale, shear, and linear translation in the phase-encoding direction.23 The 25 elements for each voxel, calculated from the images that were obtained by applying diffusion-sensitizing gradients in the 25 noncollinear directions, in addition to a nondiffusion-weighted image, were diagonalized to compute the eigenvalues (λ1, λ2, and λ3) of the diffusion tensor matrix. The apparent diffusion coefficient (ADC) and FA were subsequently calculated. FA values at approximately 1 are totally anisotropic, and FA values at approximately 0 are totally isotropic.24 FA values were visualized in 2D color maps. Fiber tracking was performed with dedicated software (MedINRIA, http://www-sop.inria.fr/asclepios/software/MedINRIA). White matter fiber tracts were created in 3D based on similarities between neighboring voxels in shape (quantitative diffusion anisotropy measures) and orientation (principal eigenvector map) of the diffusion ellipsoid and coregistered on the FA map using a special algorithm described previously.25,26 The principal diffusion directions method26–28 was used, where the eigenvector corresponding with the largest eigenvalue is extracted from the diffusion tensor field generated from the DTI datasets in the region where the diffusion was linear. The FA threshold value was 0.20, and the angulation threshold was 45° (to prevent fibers from sudden transition and to keep tracking based on the connectivity of the neighborhood), as described elsewhere.26,27 The 3D fiber reconstructions were color coded, where blue represented the superior-inferior, green the anteroposterior, and red the left-right direction. Measurements were performed blinded to the clinical status of the patient using the software packages described in the previous paragraphs. After realignment and spatial normalization, FA values of control subjects were pooled on a voxel-by-voxel basis to derive mean and SD reference values for the control group. To identify voxels of abnormally reduced FA in each patient, the patient's FA map was realigned, spatially normalized, and individually compared with the control group in a z score analysis. A |z|>1.96 (P < .05) was considered to indicate abnormal voxels, which were automatically highlighted on the z score map (Fig 1). White matter regions of voxels with reduced FA were manually outlined as illustrated in Fig 1. For each of these regions of interest (ROIs) with reduced FA, visual comparison was made with the corresponding low b value diffusion, T1, and FLAIR scans to confirm its localization in white matter. Particular care was taken to avoid inclusion of gray matter or CSF. For each region of interest, we calculated volume, FA, z score, and ADC and determined the presence of FLAIR hyperintensities and T2* GE hypointensities indicative of microhemorrhage. Selection of ROIs in a patient with mild TBI. The top row shows 2 of 30 sections of the z score map of fractional anisotropy, superimposed on a b = 0 DTI scan. Pixels with a z score less than −1.96 are highlighted in purple. Abnormal regions are visible in the splenium and genu of the corpus callosum (top left image) and in the right semiovale center (top right image). ROIs, including these abnormal pixels, were manually drawn, as illustrated in the lower row of corresponding images. The ROI localization in brain white matter was categorized according to the following classification: cerebral lobar white matter, cingulum and corpus callosum, anterior and posterior limb of the internal capsules, mesencephalon, brain stem, and cerebellum. Cerebral lobar white matter was subdivided in centrum semiovale, frontal lobe, parietal lobe, temporal lobe, and occipital lobe. If an ROI extended in more than 1 of these locations, all of the involved locations were scored. Fiber tracking software allowed for reconstruction of merely the fibers that passed through a given ROI. The number and length of individual through-passing fibers were calculated for each ROI, and we determined the anatomic type of through-passing fiber bundle(s)29 that was composed of the individual fibers. Finally, the reconstructed through-passing fiber bundle was visually judged for discontinuity at the level of the ROI. The number of ROIs with reduced FA was calculated as n (%) for the total of patients and as mean ± SD to describe patient averages. ROI volume, FA, z score, ADC, and number and length of through-passing fibers are given as means with 95% confidence intervals. Pearson correlation was calculated between these parameters and the time interval after injury. White matter fiber bundles that were involved in regions with reduced FA are given as n (%) for the total of patients. A multiple linear regression analysis was applied to identify variables that were related to the presence of discontinuous fibers in an ROI. Using the χ2 test, the distribution of ROIs among various white matter regions and the proportion of discontinuous fiber bundles were compared between patients who were investigated less than 3 months and at or more than 3 months after injury. In all of the analyses, data from the left and right sides of the brain were pooled, because we found no significant differences between both sides of the brain. A P value less than .05 was considered to indicate a statistically significant difference. T1-weighted, FLAIR, and T2*-weighted MR imaging were normal in 17 of 21 patients. Four patients showed peripherally located contusions, and one of these patients also had an extra-axial hematoma. We identified 191 white matter regions with reduced FA in our patient group. Four of these regions contained FLAIR hyperintensities, whereas in none of the 191 regions signs of microhemorrhage were found on T2*-weighted GE imaging. Most regions with reduced FA were located in cerebral lobar white matter (61.8%; Table 1) or included the cingulum or corpus callosum (23.6%). The number of regions located in cerebral lobar white matter was comparable in the centrum semiovale, the parietal lobe, and the temporal lobe, whereas most lobar white matter regions were found in the frontal lobe and few regions in the occipital lobe. In the centrum semiovale 9 (33.3%) of 27 regions were subcortically located or had a subcortical part compared with 14 (33.3%) of 42 frontal lobe regions, 10 (32.3%) of 31 parietal lobe regions, 16 (57.1%) of 28 temporal lobe regions, and 0 (0%) of 4 occipital lobe regions (P = .10, χ2 test). The frequency of regions with reduced FA in the internal capsules, mesencephalon, brain stem, and cerebellum ranged from 5.7% to 2.1%. No regions with reduced FA were found in the external capsules. On average, each patient had 9.1 regions with reduced FA, of which 5.7 were located in cerebral lobar white matter, 2.1 in cingulum/corpus callosum, and at or less than 0.5 each in internal capsules, mesencephalon, brain stem, and cerebellum. The distribution of regions with reduced FA among the white matter locations did not differ significantly between patients who were investigated less than 3 months after injury (n = 9) and those who were investigated more than 3 months after injury (n = 12; P = .98, χ2 test). Average volume, FA, z score, ADC, and number and length of through-passing fibers of regions with reduced FA are shown in Table 2. None of these parameters showed a statistically significant correlation with the time interval between injury and MR investigation. In 140 of the 191 regions with reduced FA, 1 fiber bundle was identified on fiber tracking, 2 were identified in 45 regions, 3 were identified in 5 regions, and 4 were identified in 1 region. Most of these 249 fiber bundles included supratentorial projection fiber bundles (27.7%; Table 3) and corpus callosum fibers (sum of genu, body, and splenium: 21.7%). Among association bundles, fronto-temporo-occipital fiber bundles were most often involved (19.3%). The fornix was identified in 1 patient. In the 249 white matter fiber bundles, we found discontinuity in 48 bundles (19.3%). 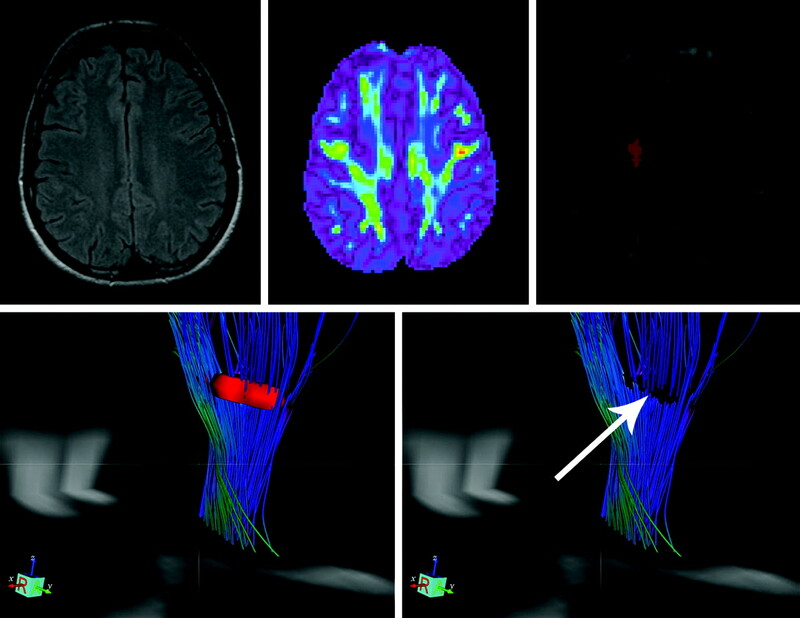 Figures 2 and 3 show examples of fiber tracking analysis, with discontinuous fibers found in 2 patients with mild TBI. Most of the discontinuous bundles were supratentorial projection fiber bundles (33.3%) or fronto-temporo-occipital fiber bundles (25.0%), but also fibers of the major forceps were discontinuous to a relatively frequent extent (14.6%). In a multiple linear regression analysis, the presence of discontinuous fibers in an ROI was significantly related to FA of the ROI (b = −7.303; P = .006) but not to z score, ADC, or volume of the ROI, nor to the patient's age or the time interval between injury and MR investigation. The proportion of discontinuous fiber bundles did not differ significantly between patients who were investigated less than 3 months after injury and those who were investigated more than 3 months after injury (17 of 85 fiber bundles versus 31 of 164 fiber bundles; P = .84, χ2 test). FLAIR scan, FA map, and fiber tracking in a 49-year-old patient with TBI who was imaged 16 months after the initial trauma. The FLAIR image shows no abnormalities (top left image). After analysis of the color-coded FA map (top middle image), a region with reduced FA was identified in the white matter of the left frontal lobe. 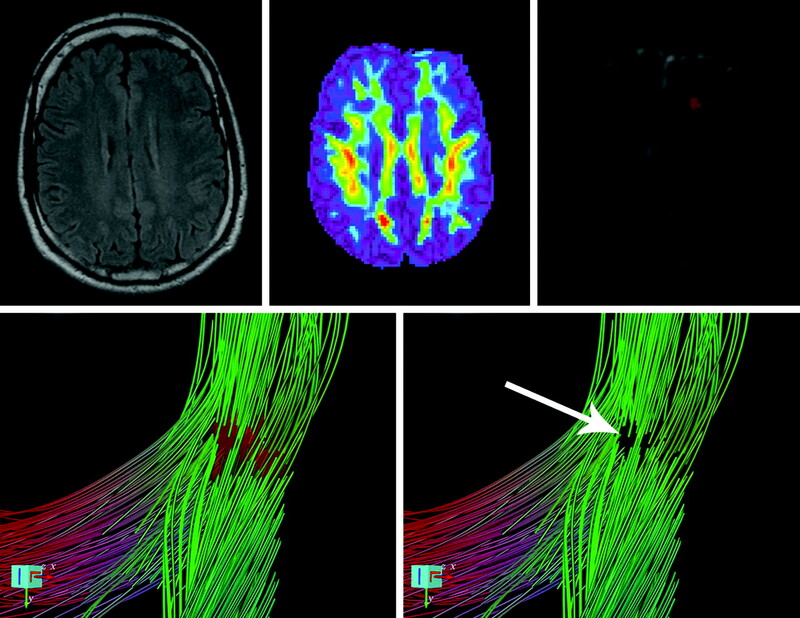 This ROI, illustrated in the top right T2-weighted image, included forceps minor and fronto-temporo-occipital fibers (bottom left image, superior oblique view; the ROI is red and located centrally; the fibers are superimposed on an axial T2-weighted scan). At the level of the ROI, the respective fibers are discontinuous (arrow, bottom right image; the ROI is left out in this image). FLAIR scan, FA map, and fiber tracking in a 38-year-old patient with TBI who was imaged 2 weeks after the initial trauma. 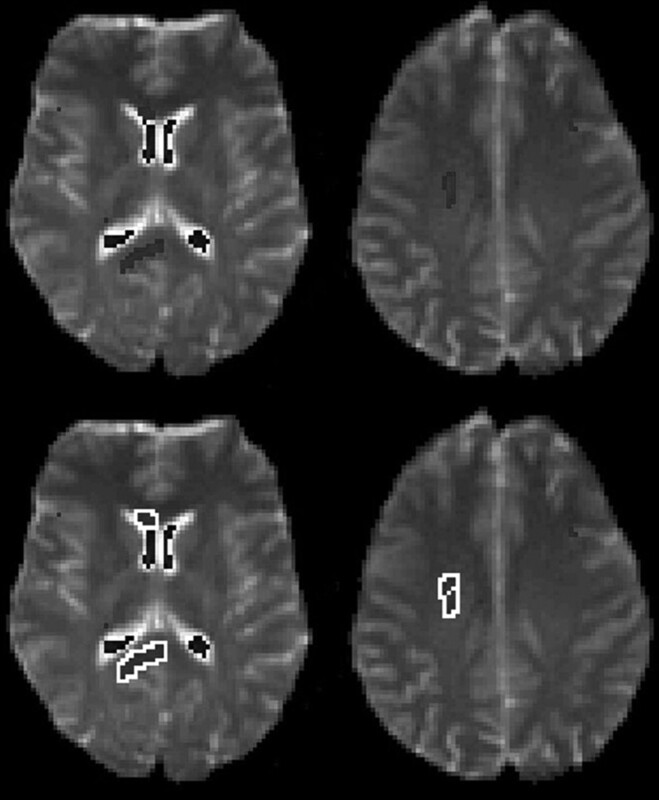 The FLAIR image shows no abnormalities in the semiovale centers (top left image). After analysis of the color-coded FA map (top middle image), a region with reduced FA was identified in the right semiovale center. This ROI, illustrated in the top right T2-weighted image, included projection fibers (bottom left image, postero-latero-superior view; the ROI is red and located in the top right quarter of the image; the fibers are superimposed on a multiplanar T2-weighted scan that shows the lateral ventricles in white). At the level of the ROI, projection fibers are discontinuous (arrow, bottom right image; the ROI is left out in this image). This study has 3 major findings. First, compared with control subjects, patients with mild TBI had multiple white matter regions with reduced FA, predominantly involving cerebral lobar white matter, cingulum, and corpus callosum. Second, white matter fiber bundles that were frequently included in these regions were supratentorial projection fiber bundles, callosal fibers, and fronto-temporo-occipital association fiber bundles. Third, there was no significant relation of the time interval after injury with our DTI and fiber tracking findings. Predilection sites for traumatic axonal injury include subcortical white matter, internal capsules, corpus callosum, fornix, and infratentorial white matter (brain stem and cerebellum).9–12 We found that, in mild TBI, predominantly cerebral lobar white matter, including subcortically located white matter, cingulum, and the corpus callosum were affected. It may be suggested that abnormalities in the internal capsules, fornix, brain stem, and cerebellum are markers of more severe TBI, because these sites were infrequently involved in our patients with mild TBI. Traumatic axonal damage can vary from small foci to widespread axonal injury, depending on the severity of the initial trauma.7 In this regard, the relative vastness of affected fiber bundles in our patients seems not in proportion with their relatively mild initial trauma. However, even mild TBI patients show diffuse neuronal and axonal injury as evidenced by a reduction in whole brain N-acetylaspartate30 and a global decrease of white matter FA.22 The diffuse character of these types of injuries is in accordance with our finding of rather widespread affected fiber bundles. Our results are supported by a recent study in mild TBI.15 Although that study found no difference between patients and control subjects in a whole-brain histogram analysis, ROI analysis in a few white matter regions (corpus callosum and internal capsule) did show FA reduction both in a subacute and chronic stage. We found a considerably larger number and distribution of abnormal regions. This may be explained by different methods. Possibly our voxel-based analysis detected more subtle FA abnormalities than a histogram analysis. Furthermore, ROI analysis that is limited to a few white matter regions may leave other regions with reduced FA undetected. Among the multiple regions with reduced FA in our patients, we identified only 1 that involved the fornix, though this structure is known to be affected in TBI.12 The fornix was either not affected in many of our patients because of their relatively mild degree of head trauma or it was too small to be detected. Similarly, we may have underestimated the extent of injury in other small fiber bundles, such as the anterior and posterior commissure. Our study indicates that DTI and fiber tracking characteristics of regions with reduced FA remain unchanged during subacute and chronic stages of mild TBI, because we found no significant change of these characteristics when correlated with the time interval after injury and no significant differences between patients who were investigated less than 3 or at or more than 3 months after injury. Our findings are supported by a previous study in patients with mild TBI who demonstrated FA reduction in the corpus callosum and internal capsule.15 These abnormalities were found to be present both in subacute and chronic patients. From this previous study and our results it may be suggested that subacute or early chronic DTI changes are an indicator of long-term DTI abnormalities in mild TBI. Longitudinal studies are needed to investigate this. It should be emphasized that our results do not necessarily apply to acute TBI, because we did not investigate patients within 24 hours after injury. The time course of DTI and fiber tracking abnormalities may be different in acute patients because acute posttraumatic changes may evolve rapidly. The cause of FA reduction in brain white matter in TBI is not fully understood. Generally, it is attributed to a change in parenchymal structure.12,15,17–19 This may include misalignment of fibers, edema, axonal degeneration, or fiber disruption. In the setting of brain trauma, it should be stressed that axonal degeneration may be caused by traumatic axonal injury but may also be induced by overlying brain contusions. Chronic contusions can be difficult to appreciate on imaging, in particular if they are small and peripherally located. It is known that mild TBI can cause fiber disruption,31 but it is improbable that all of the regions with reduced FA in our patients represented in vivo fiber disruption, because fiber tracking showed discontinuity in only a minority of fiber bundles. We hypothesize that most regions were related to fiber misalignment or edema or to degeneration in chronic patients. Where we found discontinuous fibers, it is not evident that these fibers were disrupted in vivo, because we had no histologic correlation. Discontinuity on fiber tracking may have been caused by the presence of sharply angulated fibers in an ROI, impeding full fiber reconstruction, or by small areas of hemosiderin that were not visible on MR imaging. These areas may have induced significant intervoxel variations of FA, which may have impeded full fiber reconstruction as well. Nevertheless, it may be suggested that regions with discontinuous fibers on fiber tracking are more likely to include disrupted fibers in vivo than other regions. The clinical correlation of FA reduction in mild TBI remains to be elucidated. From patients with various trauma severities, it is known that FA reduction is correlated with clinical admission and outcome scores.17,18 Possibly, FA reduction in mild TBI gives evidence of axonal injury that is related to long-term neurologic or neuropsychologic abnormalities.3–6 Follow-up studies and neuropsychologic correlation are needed to investigate this. To define regions with abnormally reduced FA, we compared patients with control subjects in a voxel-based z score analysis. This allows for a clear definition of abnormality that is independent of absolute FA values, which vary with white matter location. However, in periventricular regions, realignment and spatial normalization in relation to control subjects may be difficult, even with dedicated algorithms.32 This may cause an overestimation of lesion size in these regions. Further limitations of our study were that no histologic correlation of DTI findings was available and that no neuropsychologic measurements were performed. For obvious reasons it is difficult to obtain histologic confirmation, but we anticipate that further pathophysiologic insight may be gained from future longitudinal studies and neuropsychologic correlations. The present study shows that patients with mild TBI have multiple white matter regions with abnormally reduced FA, predominantly in cerebral lobar white matter, cingulum, and corpus callosum. These regions predominantly involve supratentorial projection fiber bundles, callosal fibers, and fronto-temporo-occipital association fiber bundles. A minority of these fiber bundles show discontinuity on fiber tracking. The clinical and pathologic-anatomic correlation of these findings remains to be elucidated, but possibly they are related to chronic complaints or long-term axonal damage. We give special thanks to Prof Tadié for his contribution to this study. This study was supported by the Institut pour la Recherche sur la Moelle épinière et l'Encéphale (IRME), Paris, France. Previously presented in part at: 34th Congress of the French Society of Neuroradiologie (Société Française de Neuroradiologie), March 26–28, 2007; Paris, France. Accepted after revision September 4, 2007.